Just a short note to say that I have been unwell in the last week and will be taking another week off. Back soon I hope! Don’t let edges just touch – it can confuse the viewer spacially. Don’t let lines for different objects join to look like the same line – that can be confusing. Don’t have objects or people which face out of the picture – they draw the viewer’s focus away. Don’t have objects directly on top of one another – it looks a bit odd. Having objects too far apart at opposite sides of the paper with nothing much in the middle looks odd too. Avoid putting everything together in a tight space becuase this looks odd too. I think this is because this is not the way things normally lie on a surface when they’ve been put down in nature – one or two objects nearly always move further away from the rest. And finally don’t put two object too close together without allowing them to touch as it can create a distracting tension. Having read all of these my feeling is that the unwanted effects of some of these things could, perhaps, be used actively in the right picture. For instance – the tension between two objects which don’t quite touch could be distracting in the wrong place, but it could equally be used, I think, if the picture warrents it. So here is a picture I’ve made which breaks the rule. It’s a picture of two cranes dancing in courtship. Because it’s a courtship I want there to be a tension between the two creatures – so having them close but not touching is perfect. This is going to be my last post for a week as I’m in the process of moving house and I have a lot of preparation to do. So I’m going to be taking a week off. After that I’ll be posting three times a week instead of five to keep on top of the work I need to do at home. I might keep it like that or I kmight go back to five times a week once I’m settled. Today I’m going to move on to learn a bit more about how to compose a painting. Previously I’ve always done this by eye and by just “having a feeling for it”. However in my painting tutorial book – “The Oil Painting Course You’ve Always Wanted” by Kathleen Staiger – there is a whole chapter on it and I’ve not even heard of most of the technical terms before, let alone know the theory. The first part of the theory is the “Format” of the painting. This means the shape of the paper or material which is being painted on. I frequently work on A4 paper as I’m studying paintin becuase this provides enough space for em to try things out without using too much paint or taking too long for each study. I am aware that you can have all sizes of canvases but I’ve never really though of having an irregular canvas or a circular one. It’s interesting to think about that. The second section of theory is something called the “Interval”. This is the space or spaces between objects in a painting. Bascially instead of look at the picture as what it is you can look at it as a set of shapes which form part of the painting. There are spaces or somtimes lack of space between each of the main shapes an this has an effect on how a viewer looks at the painting. Now I quite like things lined up in a regular pattern but this is not generally regarded as artistic so instead I try to follow the patterns I first saw in chaos theory and in fractals which mimic natural forms. Apparently having a painting with good intervals means having each interval different from the others. The fourth thing to think about when composing a picture is “Space” this means creating a sense of depth in the picture. This is done by making things which are further away smaller and less intense and by overlapping things. 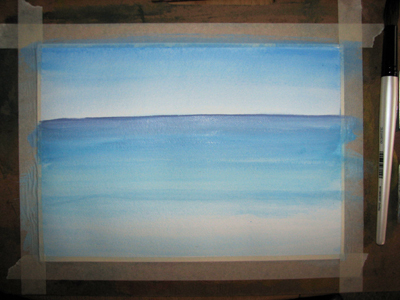 Giving the viewer a picture to look at which appears to have depth also makes a good painting. This final element of composition is the hardest for me to understand and put into practice. Basically the principle is to make some part of the picture the main ‘point of interest’ and make this part stand out a bit using a wide tonal range and stronger and more intense colours. Then you use the other things in the painting to kind of point to the main place of interest. So, for instance you could surround the main interest of your painting with a pattern of objects which provide a contrast to the focal point which makes it stand out a bit more. Or you could get some inanimate objects to literally point to what you want the viewer to look at. Another method is to use a figure in the painting and make them look at the point of interest. 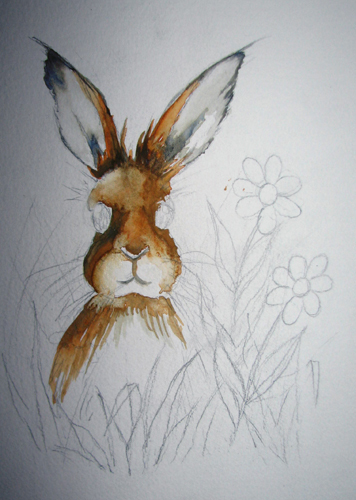 So thinking about all of this I did a quick illustration today of a little rabbit in a flower meadow. I first saw this little chap on a birthday card and I just really liked him. Hoever on the card he was centred in the middle of a plain field of grass which was just drawn as lines. Because of the way the card was designed I saw an opportunity to completely rework the composition. I chose to move the rabbit, my point of interest, to the left slightly and then have the grass and flower stalks poke up in a spray heading upwards and outwards – like a spray of flowers. I also positioned some flowers around the rabbit to frame him. I kept the flowers simple with him between them to try to make him stand out even though he’s kind of popping his head up in the meadow. I painted him with my darkest darks and lightest lights to make it clear that he’s the subject although I did use a couple of dark greens int eh foliage on the left and in the centre to balance the heavier foliage on the right hand side. 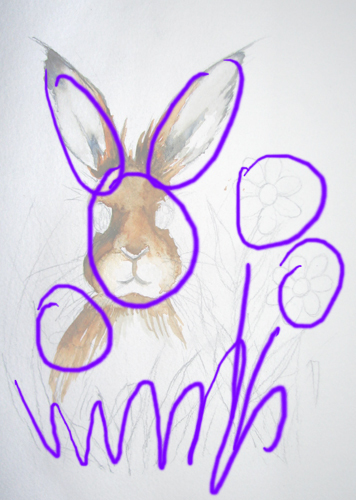 Two of the flowers are seperated from the rabbit but one is overlapping and they have different intervals vertically and horizontally. I didn’t put anything over the rabbit and let his large ears extend into space to give the feeling of him being in the open and free. Today I did another exercise following a painter on YouTube. Again I wanted to look at light and highlights. This video is by a chap called Mural Joe. What I wanted to concentrate on in this exercise is how to get the wave to look like it has light coming through it. I applied the same rules as I did on the mountain study for glowing light – I made the sections where I wanted light to glow through the water lighter and of a stronger colour (in this case a blue/green). 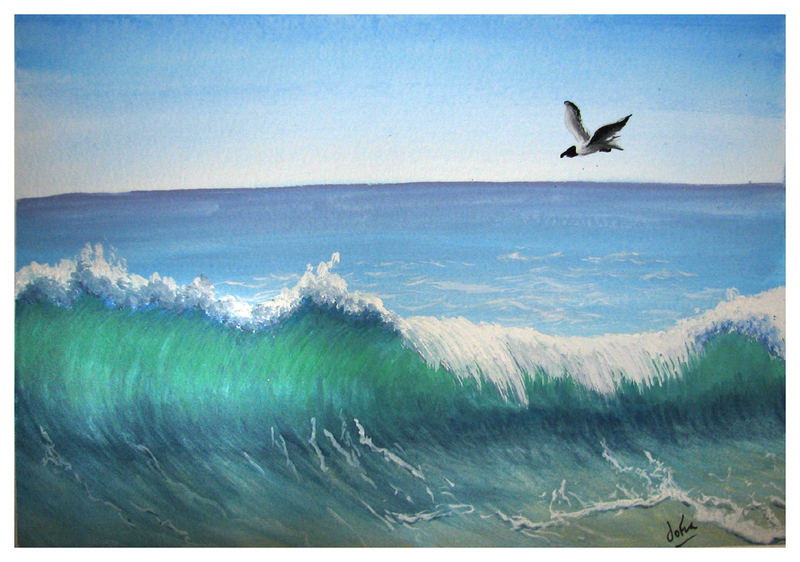 Then I painted in the wave and then had incredible fun playing with painting the foam in the foreground. I really loved working on that bit! A Wonderful Wonderful Day at the National Gallery! Last weekend a few friends and I went to visit the National Gallery in London. I was looking forward to seeing how really brilliant painters do their thing and hoping it would be good but I had no idea how amazing the experience would actually be. It was fantastic! I’m still so amazed by it that I’m finding it hard to put my feelings into words. I think the thing which shocked me most of all was how very different it is to see these paintings in real life compared to images of them you can see on the comptuer or even prints that you can buy. They are an order of magnitude more beautiful in real life. They are luminous. Anyway here are my top 12 paintings for this trip. (We didn’t get to see the whole collection in one trip – it’s too big!) According to the National Gallery these paintings can be reproduced in this blog under the Creative Commons license. According to this license I have to let you all know that I’ve made no changes to the pictures. My favourite painting of all was Whistlejacket by Stubbs. We were on our way from the barogue Era to the Impressionists when I saw this painting through a doorway off to the left – it looked to me like a live horse in the gallery. The colour was so rich and the lines were so perfect and so clear I was completely transfixed. I liked this so much a bought a print but the print doesn’t look even half as good as the original – the colour is too dull and flat in the print. It still serves as a good reminder though. My third favourite is Wheatfield and Cypresses by Van Gogh. I turned the corner into this particular room and this painting was like a blaze of light and colour – it was so beautiful. Looking at the computer image now it looks nothing like the real thing. I’ve always liked Van Gogh’s simple style but until I saw this painting I never understood his genius before. It just shines out. It was stunning. I had a most wonderful time at the National Gallery. We walked and looked until I thought my body would collapse it was so good. We’re already thinking of going back again as soon as we can! Thanks to a brilliant idea from Earthbalm I’m going to deviate from my painting book for a couple of days and have a look at tints and other highlights. It makes sense after looking at shadows. 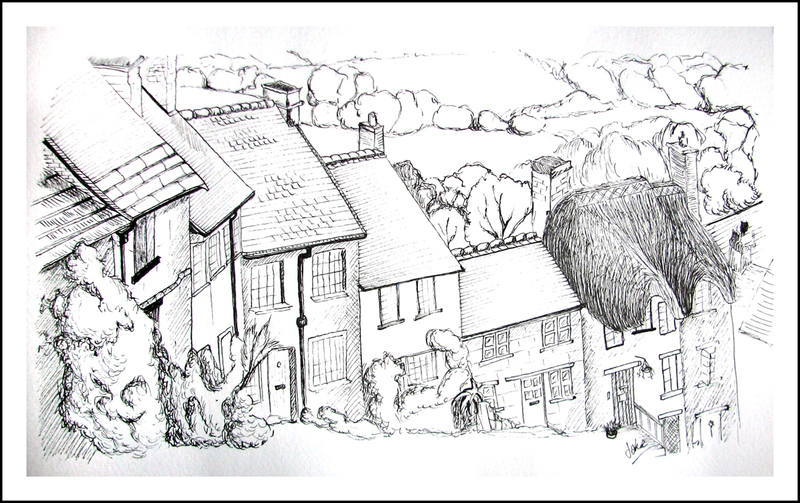 It’s by a chap called Richard Robinson – he’s clearly a really good artist and I think he’s a super teacher as well. I decided to have a go at the exercise he’s doing in this video – it concentrates on light, especially glowing light and the subject is simple enough for me to handle ok. I don’t have any oils at the moment so I’m going to use gouache, nice and thick so it performs light oil paint. Like Mr Robinson does in the video I used paint to sketch out my shapes to begin with. It’s the first time I’ve painted with no pencil underneith. 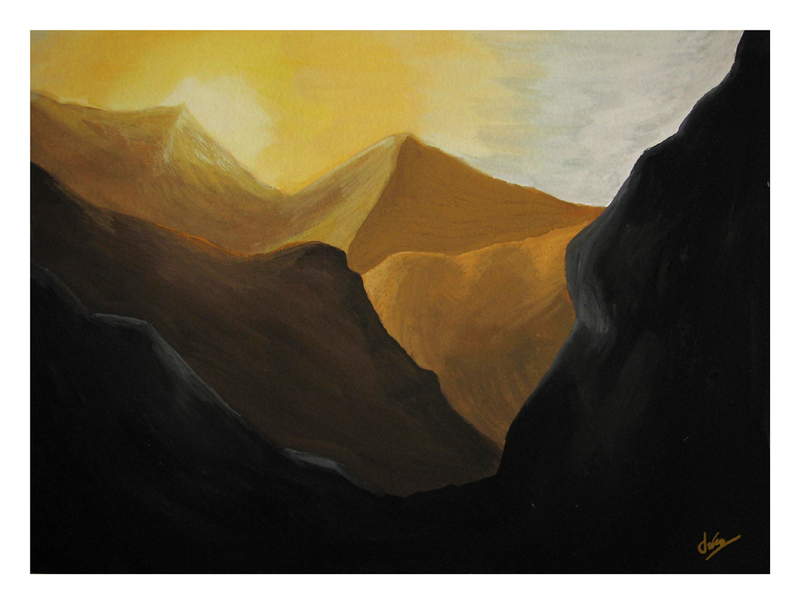 I found that, although the mountains themselves are quite simple shapes, the lighting effect I was trying to do was actually really difficult. I got so engrossed in it that I forgot to take any process photographs. I tried to lighten and deepen the colour of the glow as I got closer to the sun but it was hard. At first I failed because I wasn’t concentrating hard enough on my mixing, but I think with this kind of exercise the mixing of the exat colour you need is the most important thing. Eventually I got something down which began to look a bit like the lighting effect I wanted. It will take more practice to really get the hang of it though. Another thing which I found really interesting whilst doing the painting the above was that, at first I was feeling reticent and a bit stingy with my paint. Because of that I kept struggling to get the paint thick enough to work it how I needed and that almost ruined the painting. What I learned from this is that there is, I think, a generosity needed in artistic endeavour, a giving kind of spirit which lays the paint down fully and freely even though it’s not exactly cheap and you have no idea, at the beginning if it will work out. It is an act of faith. 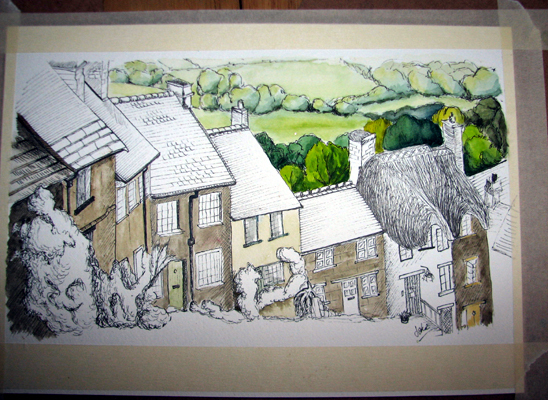 Today I had a go at putting a watercolour wash over my ink drawing of Gold Hill in Shaftesbury, Dorset. I began with the countryside in the background, using strong saturated colour near the houses and weaker paler colour for the land in the distance. 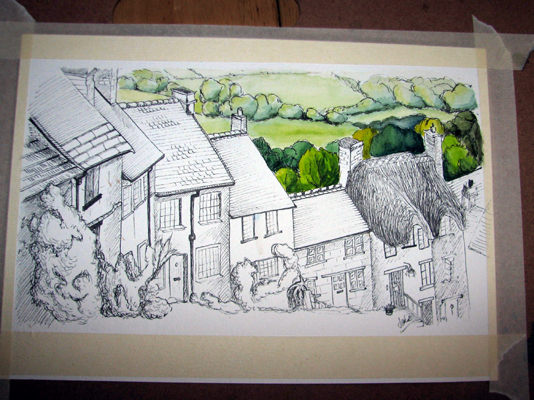 Then I began top work on the lighter parts of the houses. Then finally I finished it. I think this is the first line and wash I’ve made which I like. Over the next couple of days I want to have a break from studying shadow colours and make a ‘line and wash’ picture. 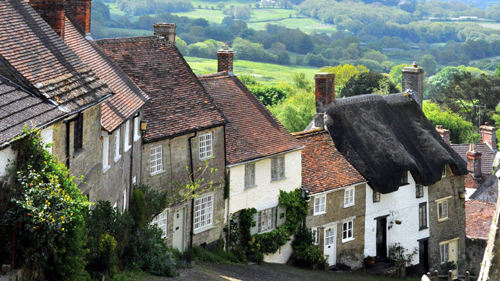 When I was in my twenties I went to Gold Hill which is a place in the town of Shaftesbury down in Dorset. I had seen it before on the TV becuase it was used as the location for the Hovis bread adverts. It’s basically an old fashioned street on a steep hill. I used a proportianal divider to draw this ink drawing since the buildings sit in a variety of different orientations and finding all the vanishing points was too confusing. 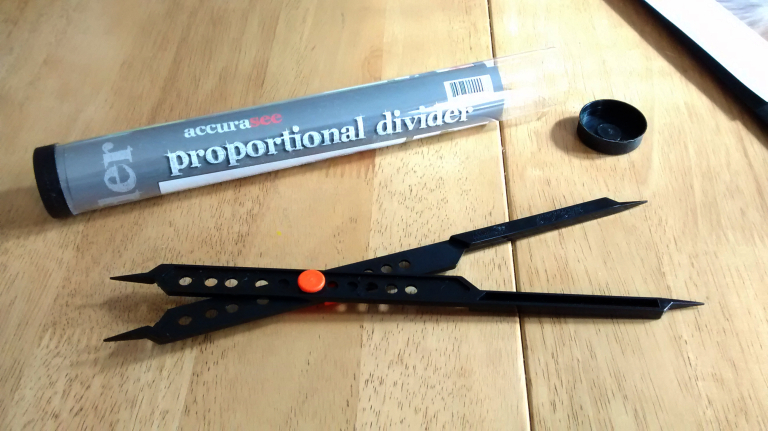 A divider helps me see the relative sizes and positions of things even when I’m scaling up from an image (or a collection of images) on my PC. I normally just make some dots for fixed points and then draw a skeleton frame of the main shapes. After that the actual shapes and the details are easy to put in. 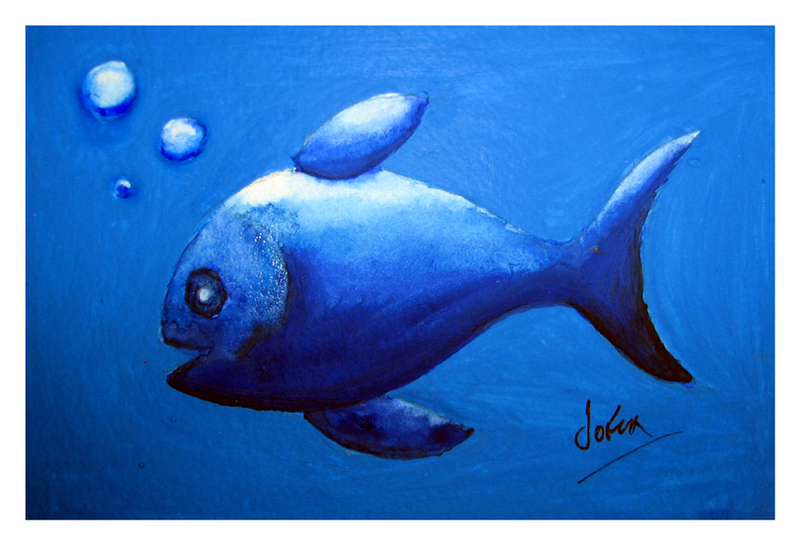 The Blue Fish – Shadow exercise. 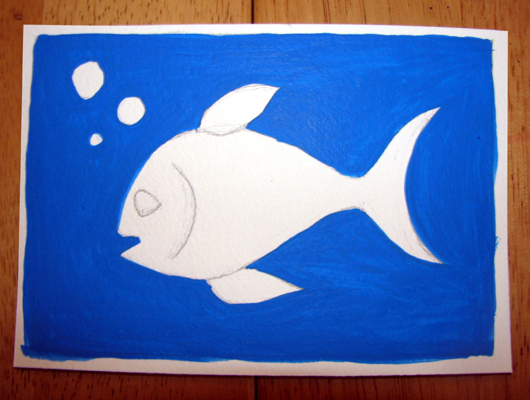 To help me really consolidate my new understanding of painting shadows I painted a blue fish today as an exercise. The idea is to really make use of this new way I’ve learned to reduce the strength of a colour as it get’s darker. When I first tried this I was using orange to drop the strength (saturation) of the blue colour (since orange is the opposite to blue). However, orange has a very bright natural tone and it kept lightening my tone too much so I used an orangy brown to drop the colour strength of the blue and that worked really well giving me a bluey-black colour. I used a strong midtone background to my fish so that I would have to work to get the fish to show – creating much lighter areas and much darker areas. 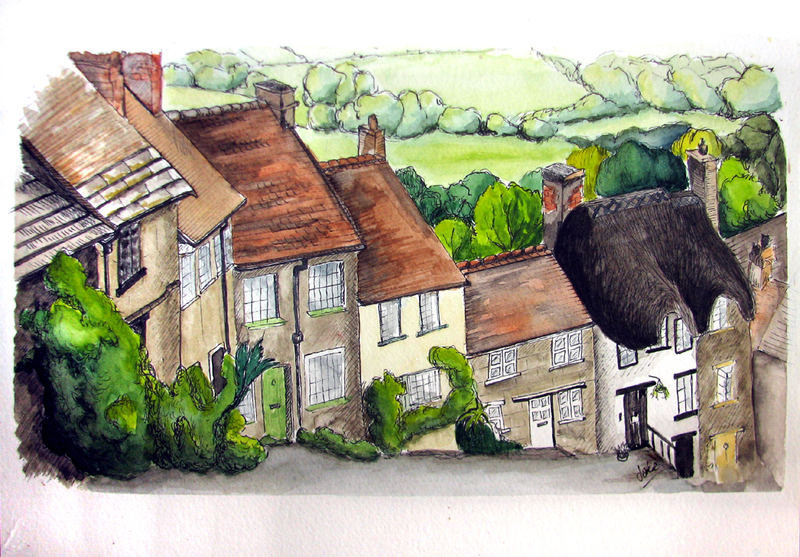 It was painted in gouach but I tried to use the colour a bit more like watercolour, especially near the top. I could have got a similar effect using white gouach but I though that the interesting mottled watercolour effects suited a watery subject. 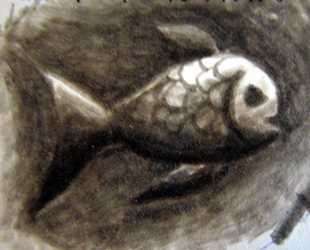 What I was aiming for was to have a fish which looks like it’s local colour is the same as teh background, so that it’s shape is picked out only by shadows and highlights. I think it’s almost there.